Dull-yellow fluorescent lights and the smell of industrial-strength antiseptic meet you when you enter the mortuary at the very edge of Braamfontein. A sense of dread, of being in a mortuary, accompanies you when you enter the grey building wedged between Constitutional Hill and the Wits Esselen Residence. 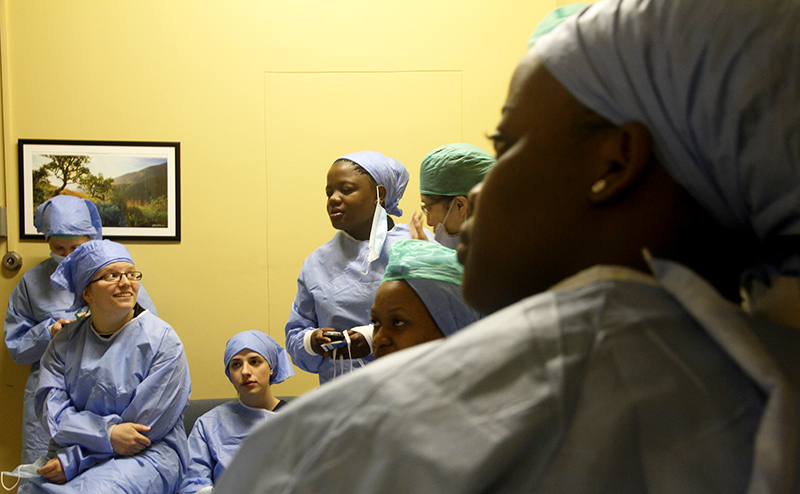 What these experiences don’t prepare you for is the warmth and passion of the Wits medical students you find inside – there to fulfil the requirement that they learn to work with “fresh corpses”. “A lot of these students see an autopsy for the first time and get turned off,” said Lawrence Hill, research student and entomologist at the Johannesburg Forensic Pathology Service (FPS) medico-legal mortuary in Braamfontein. Hill explained how the small number of medical students who specialise in forensics end up working as pathologists. Most choose lucrative jobs as anatomical pathologists for private labs. This leaves state pathologists working in one of the two main mortuaries in the province ̶ Germiston and Johannesburg ̶ doing nothing less than 20 autopsies a week, almost double the weekly average. Hill was frank about the difficulties of dealing with corpses on a daily basis and the kind of effect it can have on you. “We see everything from [people who were] stabbed to death, jumped off of buildings, car accidents and burns victims who mostly came from informal settlements,” said Hill. He said counselling was provided to students at the Charlotte Maxeke Hospital and they were encouraged to talk in groups about their experiences. A student called Trudie said the “scary reality didn’t really hit you” until you were faced with a recently deceased body. Kirsten Morley-Jepherson said she was “really lucky to have a good support system at home”. “Once you vent you really feel a lot better”. Masello Phasha recalled how she was “literally shaking” when she faced a corpse for the first time. Phasha said Monday was “very different”. “The child was still fully dressed and still had shoes on,” Phasha said. Despite this, Phasha said she’d “surprisingly” had no nightmares and she hoped to go into trauma surgery but feared the always-on-call lifestyle would be “too demanding”. Abigail Keane is a student whose entire family is in the medical field. She said, despite realising “how quickly things can go wrong and how many lives we lose”, it was the daily opportunity of helping people in a tangible way that made it all worth it. The mortuary serves as the “academic seat” of the Wits division of forensic medicine and pathology. It provides forensic pathology services to the SA Police Service and the Department of Justice and families of the deceased. This is over and above its teaching and research responsibilities at the university’s Faculty of Health Sciences.